When Oseye Gaddy placed down the phone at her desk, she was unable to contain her excitement. She had just gotten off the phone with the CEO of her company. Out of 190,000 employees throughout the world, FedEx Express president and CEO David Bronczek, one of the company's most influential executives, had chosen to reach out to an ordinary customer service representative, working across the country in Tacoma, Wash. But Gaddy is hardly your average customer service rep these days. She's also the mother of one of the most highly-sought-after and uncommitted basketball recruits in the country, Abdul Gaddy. And Bronczek is not merely a CEO. He is also a booster of the University of Memphis basketball program. Well, I'm sure that the CEO didn't know who Gaddy's son was. They probably just talked about call center issues and...wait... he knew. Per Fox Sports "I was like, 'Why would he want to talk to me?' But the whole time he talked to me, he talked about my son. He was just talking to me a little bit about (John) Calipari and the program and then he was telling me about The FedEx Forum and how he goes to a lot of games and sits on the floor," she added. 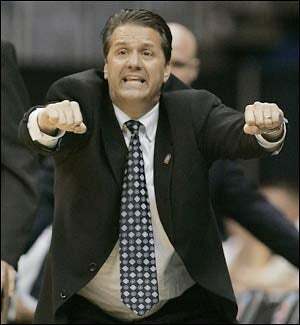 "How Calipari is a really nice guy." Just a little heads up to the NCAA, while they're looking into this incident they might want to check out some cosy FedEx internships that the Tigers players get to partake in. I'm sure those positions are just as coincidental as this phone conversation.